March is Women's History Month, and here in the Golden Gate National Parks, we are fortunate that the Presidio is led by a remarkable woman who has made—and will continue to make—history. As CEO of the San Francisco Health Plan, Jean Fraser led the effort to make San Francisco the first city in America to provide health care for all uninsured residents. She brought a similar ethic of equity to her work as chief of the San Mateo County Health System, before transitioning to her current position as Chief Executive Officer of the Presidio Trust. Jean came to our park in September 2016, charged with leading the federal agency that manages the Presidio—a jewel within the Golden Gate National Recreation Area. Park E-ventures recently sat down with Jean to hear about her inclusive vision for the Presidio, and how she's going from health care for everyone to "parks for all." You come with an impressive resume in the public health sector. Why are parks so integral to the health of a community? Most people think that health comes from going to a doctor's office—that's not true. Health begins and is maintained in our homes, in our schools, on our streets and our sidewalks, and places where we play—such as parks and playgrounds. One of the reasons why I made the conscious decision to leave the health world is that the United States spends far more, per person, on health care and yet has some of the worst results—compared to all the industrialized countries in the world: the highest infant mortality rates, the highest rates of entirely preventable diabetes, all stemming from heart disease and other chronic conditions. We know that parks are an absolutely crucial part of relieving chronic stress, which we also now know affects us on a biological level. We know, through a recent study from Stanford, that in comparing someone walking along a busy road, as opposed to someone walking in a park, there is a visible difference in their brain chemistry. Humans grew up in nature; we actually have a connection with nature, whether we are consciously aware of it or not. Getting time in green space—in places where you can see trees, plants, and animals; and feel the wind; and breathe clean air—can have a profound effect not just on our mental state but actually, literally, on our physical state. What we know is that 30 minutes of exercise is just as effective, if not more effective, than many, many, many drugs that we take for heart disease and other conditions. So that's one of the reasons why the parks have partnered with physicians to offer park prescriptions—and I know that the GGNRA [National Park Service], Golden Gate National Parks Conservancy, and the Presidio Trust participate in that program. It's a great one. What's your overarching vision for the Presidio? I think the Presidio can become the best-maintained, most environmentally sustainable, and most diverse park in the country. That's a really tall order—but I think with our unique structure, and with the incredible partnership with the Conservancy and the GGNRA, we can actually accomplish that. We can be a model for what national parks—if they were sufficiently funded—could be across the country. For me, parks—and particularly national parks—are a cornerstone of our democracy. They're the only place in the United States where we all own the land. And it doesn't matter where you come from, or what you believe, or how much money you have—you have the right to walk in and enjoy and use the national park, just as much as anybody else. It truly is by the people and for the people. What are some of the challenges the Presidio faces, in trying to welcome all people? The very physical nature of the Presidio was that it was designed with walls and gates [as a former Army post], and so, a lot of people—even people who live in the Bay Area—think the Presidio is a place reserved for "other people"—and not for them. Add on the fact that we are located in one of the wealthiest neighborhoods, and the fact that we rent out our buildings to commercial and residential tenants, and we're going to have to work very hard to overcome the perception of exclusivity. What steps will you take to change that perception? One is having a robust transportation system. A third of the people can't drive—they're too young; they're too old; they can't afford a car; or, increasingly, they're not interested in driving. So we need to make sure that you can get to the Presidio via public transit and that it's welcoming to people who come in walking or riding a bike. The second one is thinking about how we signal that we are a "place for all." So, signage really matters. The languages that we use, and the languages that our staff can speak, matter. And so do the events we put on—whether they're relevant to people living in other parts of the city, and not just to those in the closer neighborhoods. My particular passion is welcoming folks who come from cultures where the outdoors is not seen as a place of refuge-but maybe as a place that's scary or intimidating. So that means finding ways to connect with them, giving them guided hikes, making sure that they feel comfortable navigating in the park. 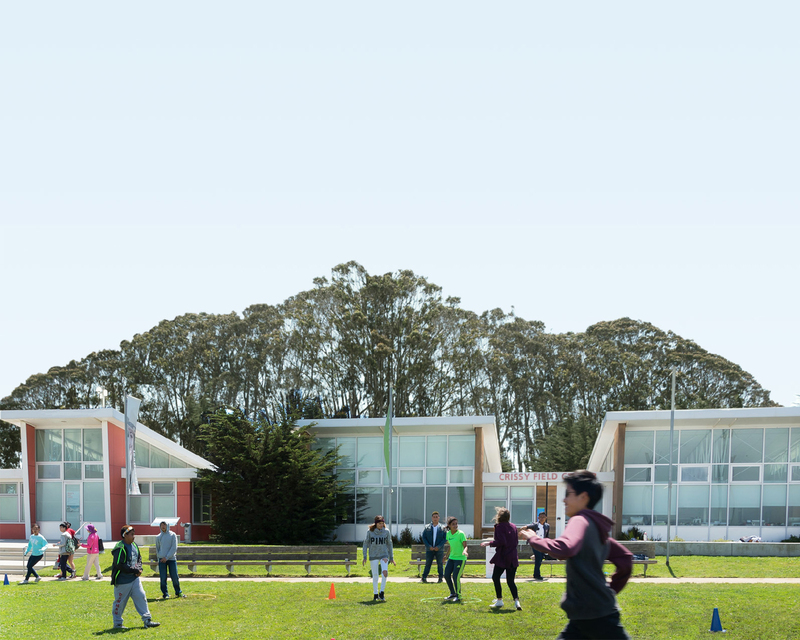 For example, our joint program—Camping at the Presidio (CAP)—gives kids who have never had the chance to go camping an opportunity to connect them (and their families) to the Presidio, to the larger GGNRA, and ultimately to national parks around the country. CAP is a program made possible through a collaboration of the Parks Conservancy, NPS, and Trust. Can you elaborate on the importance of that tri-agency partnership in caring for this park? The Presidio—and certainly the Presidio Trust—wouldn't be remotely as successful as we are without the tri-agency partnership. For all that the Trust has been able to earn in revenue, none of our trails and overlooks would have been possible without the Conservancy. In fact, it's my understanding that the Conservancy invested over $150 million in the Presidio itself—and that isn't even counting the innumerable volunteer hours required to do the pulling of the weeds and the planting of the native species. And, of course, the Park Service is such an amazing organization in terms of helping us understand and interpret our history and our ecological systems. The new Presidio Visitor Center reflects the best of all three of us. I particularly want to compliment the leadership of the GGNRA for focusing on the importance of diversifying the visitors who are coming to parks, because diversity is not the goal—diversity is the reality. We are a diverse nation, and becoming more so, every year. And if we're unable to make the parks relevant to all Americans, the parks won't have the kind of support they need for the long haul. I really applaud the Park Service for making sure that our park system isn't just about preserving places relevant to things that happened 200 years ago—but to the Civil Rights Movement, to the long history of Native Americans, to the places in the park that reflect the richness of our entire American history. How does the Presidio convey that full sweep of history? The Presidio represents an important chapter—and a complicated chapter. It was the northernmost outpost of a colonial empire [of the Spanish]. It was also the place where the order to intern Japanese Americans was signed [as the headquarters of the Western Command]. One of the things that parks do, which is more important than ever, is that they remind us of those things in our history which we hope never to repeat. But, on the flipside, of course, is that the Presidio was also the birthplace of the Defense Language Institute-because Japanese American men volunteered to serve their country in World War II by becoming translators and military linguists, training here in the Presidio [at the Military Intelligence School on Crissy Field]. Similarly, the Presidio tells the story of the Buffalo Soldiers—African American members of the military who overcame extraordinary prejudice to serve their country and became some of our very first park rangers. And we have 400 Buffalo Soldiers who are actually buried here in the National Cemetery in the Presidio. I never knew that until I became CEO—and I'm an American History major! So that's a story we'd love to have more people understand. How will the new William Penn Mott, Jr. Presidio Visitor Center help tell those stories? I think of the visitor center as doing two things: for those who have never been here before, it's a place to start and to learn about the Presidio and the GGNRA overall. It'll be an incredible asset for first-time visitors, and we see it as the first part of the Presidio Tunnel Tops project. For those who are already coming, it's a place to discover things you never knew about in the Presidio and in the GGNRA, because this is an incredibly complex place. There's so much more to this place than any individual could possibly know, and the visitor center's staff and interactive displays can show you connections to new places, people, and topics. I have to compliment the Park Service and Conservancy and Trust staff for rethinking the museum concept. The Presidio Visitor Center's so much more interactive and engaging than many similar types of places; it'll appeal to people of all ages and backgrounds. And it'll enable people to figure out for themselves what they're interested in, and not be stuck with one particular itinerary. It's really designed to make the Presidio relevant, regardless of your interests—whether it's hiking, history, native plants, or birding. What's your favorite spot in the Presidio? Immigrant Point Overlook. It brings it all together—in one spot, you see spectacular views, amazing trails, our military history, our Rob Hill Campground, our sand dunes with native plants and endangered species, and our historic forest. It honors the place so many people passed through, seeking to improve their lives, coming through the Golden Gate and ultimately building this magnificent country. What about your own story of coming to the Bay Area? I can actually tell you that it's because of the GGNRA that I decided to move permanently to San Francisco. I came out here after I finished law school, and I spent a summer out here. I hiked all over the GGNRA, and I remember sitting down one day, under a tree in Marin, looking back over the Bay, and thinking, "Why doesn't everyone in the world want to live here?" The ability to be in a dense city, where I could get around any way I wanted—not just by car but by bus or by walking or biking—with an incredibly diverse community, right next to such spectacular open space…I thought I was in heaven.